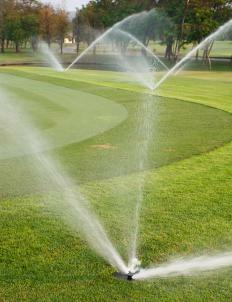 Automatic irrigation systems are programmable to run at specific times. Automatic irrigation is a form of irrigation system that is operated by a computerized controller. This type of system is ideal for those who travel frequently and cannot attend to their lawns on a regular basis. It is also convenient and highly practical for those who have farms and large landscaped areas. Once an automatic irrigation system is installed, it can be programmed to water at specific time increments. This actually conserves water since watering a lawn using a hose or an oscillator often leads to over-watering. An automatic irrigation system is capable of discharging more precise amounts of water to an area, making it an economical choice as well. Before having an automatic irrigation system installed, land owners usually are advised to conceptualize and map out a landscape design plan. This map or blueprint will determine the amount of water each lawn section will need. It is often best to understand proper plant care in order to categorize which plants are drought-resistant and which ones need more water. Plants that have similar needs should typically be strategically planted together in order to achieve optimum plant health and water conservation. After mapping out a landscape design, the next step is deciding on which type of automatic irrigation system will be installed. Systems usually come in two types: sprinkler irrigation and drip irrigation. Each type has several different features and benefits. There are four components that make up the sprinkler irrigation system. First is the timer or controller which controls water release. The three other components are the irrigation valves, sprinkler heads and underground piping. Sprinkler heads can come in the form of spray or rotor heads. Drip irrigation systems consist of tubes that have holes located at varying distances. The method of releasing the water is very different than the water released by a standard sprinkler system. The drip irrigation system is ideal for flower and shrub gardens, while the sprinkler type works best on spacious lawns. An irrigation system can also come with additional features, including a rain sensor. With a rain sensor, the system automatically turns off when a certain amount of precipitation is detected. It is basically a clever switch for the system. A moisture sensor, on the other, hand measures the amount of moisture in the soil as opposed to measuring rainfall. It is more accurate since it reads straight from the soil, but it serves the same function as a rain sensor. Professional installation of an irrigation system can cost in the thousands of U.S. dollars, depending on the size of the lawn. It may seem costly at the beginning but in the long run it could prove to be a cost-effective and ecological way of caring for lawns and gardens. Automatic irrigation systems can save both time and money and improve the appearance of landscaping when properly installed. What Are the Different Types of Rain Sensor? What are the Best Tips for Installing a DIY Sprinkler System? What are the Best Methods for Irrigation System Installation? How do I Choose the Best Automatic Plant Waterer? What are the Different Types of Garden Irrigation? What is an Irrigation Valve?